In April and May 2015, Nepal was hit by two massive earthquakes. In January 2016, our Marketing Manager, Brian Holmes, joined an ACT Alliance visit to see how your donations have supported communities as they rebuild. With the Himalayas offering a back-drop of massive solidity and magnificent strength, it is hard to imagine that they could be fragile and susceptible to change and movement. Yet that is what happened in April and May of 2015, when two massive earthquakes literally rocked the world in the central areas of Nepal, east and west of Kathmandu. The impact was devastating: nearly 9,000 people were killed; more than 600,000 homes were flattened and another 288,000 damaged; and 25,000 school classrooms were either destroyed or damaged. More than 4 million people were affected, left without access to shelter, safe water, livelihoods or education, as well as left having to cope with the psychological impact. Our Nepal Earthquake Appeal raised more than $122,000, which was sent to our ACT Alliance partner, Lutheran World Federation (LWF). The main focus of the initial emergency work was on providing instant relief in the form of tarpaulins for shelter, food and water. This happened within the first few days and weeks of the earthquakes hitting. Since then, the focus has been four-fold: shelter, water and sanitation, livelihood generation and psychological support. When the earthquake struck, Kedar Sapkota was inside his home, and his wife Ashmita and their daughter were sitting outside. The house collapsed on all of them, injuring them and destroying all their simple belongings. After they were rescued from the rubble, the community joined together to help them. The Sapkota family are subsistence farmers, but their injuries meant they were not able to work for a month. The rest of the community were not able to work due to the destruction and the trauma caused by the quake. When we met Kedar and Ashmita, they had built a temporary house with livestock pens further down the hillside and closer to the village. Having received help with materials and a grant for livestock, they were in the process of rebuilding their lives. Their main concerns for the future were whether their house would survive the coming windy season, or whether it would be blown over, and whether they would be able to replace the irrigation system that was destroyed. When asked about the help they received, they said that they were very grateful for the work and materials from the local agency, but did wonder whether enough had been done for the more vulnerable members of their community! The selflessness of these people was inspiring. Upahar Rai Chamling was sitting in her third-floor apartment in Kathmandu, which quickly became “extremely wobbly” at the time of the earthquake. At the time, she thought she was going to die, and she remained nervous and stressed for a few days afterwards. With her own experience and training (she has a Masters in Clinical Psychology from the University of Kathmandu), she began to work through her feelings with her family and friends. As a result of her experience, the 24-year-old felt that she wanted to use her skills and training to help with the relief work. She is now a Psychosocial Support Officer working with LWF, which means she spends a lot of time living with communities, leading workshops and community groups. One of the women she has worked with is 60-year-old widow Sushilaghimire. 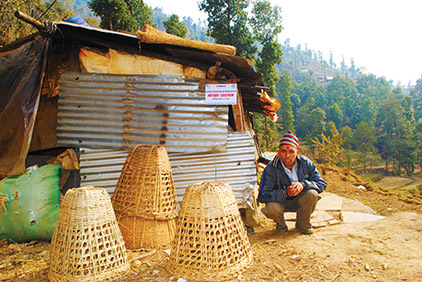 Before the quake, Sushilaghimire made her living running a small shop. In response, LWF have provided materials to help rebuild her home, as well as providing a grant for her to re-establish her shop. As a result of the earthquake, Sushilaghimire was stressed, and was not eating or sleeping properly. She has greatly benefited from attending the workshops and self-help groups that Upahar established, and treats Upahar as her daughter. Upahar’s enthusiasm and desire to help is infectious and inspiring, especially considering that she has had to deal with her own trauma from the earthquakes. It is humbling to remember that the agency staff who hosted us, and who work so hard with affected communities, have also been affected themselves. The people of Nepal are industrious and resilient, and the NGOs and government are dedicated to rebuilding. Eventually, the destination will be reached, but the journey may take some time.